Warning: This post is long and rambling (yes, even more than usual) and occasionally sentimental. And no doubt really dull for most of you. But I’ll get back to movie reviewing soon, I promise! As planned, I spent a good deal of my time with the Beiges looking at (and scanning for posterity) old family photos. 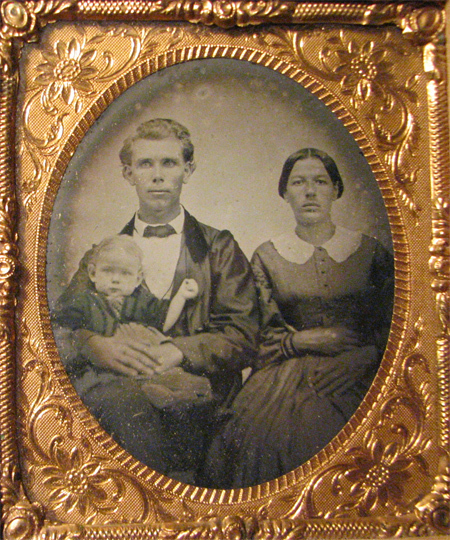 This is the oldest one I found, a daguerreotype of my great-great grandparents with my infant great-grandmother (my father’s father’s mother). It was taken in 1862 and is still in its original case, which is gorgeous. 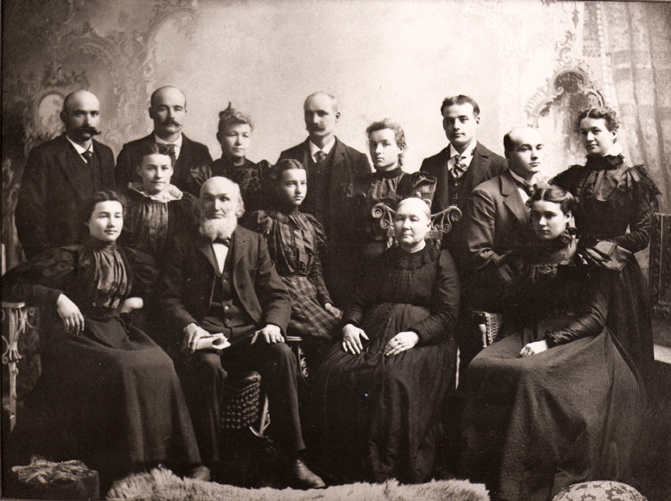 This is another set of great-great-grandparents, on their 40th wedding anniversary in November of 1897 with their twelve children—it says on the back that it’s the first photo with all of their children present at the same time. 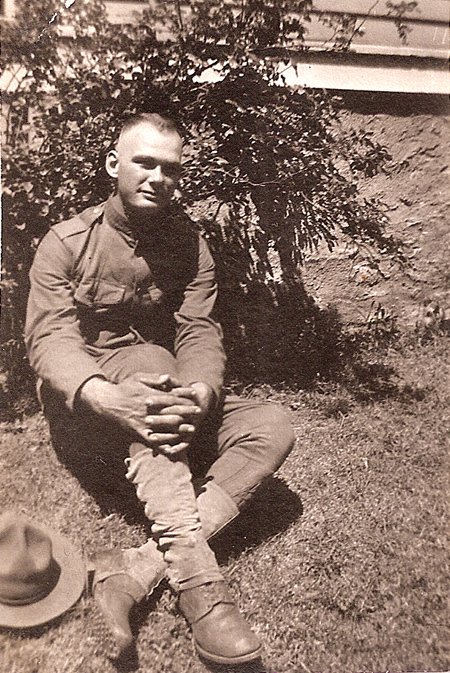 Grandpa served in Europe during World War I. My dad looks just like him! 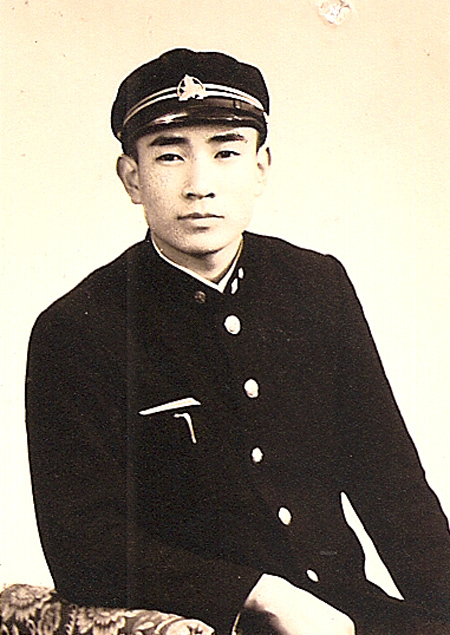 There is a whole packet of photos from Grandpa’s tour of duty during the War, but that’s a post for another day. 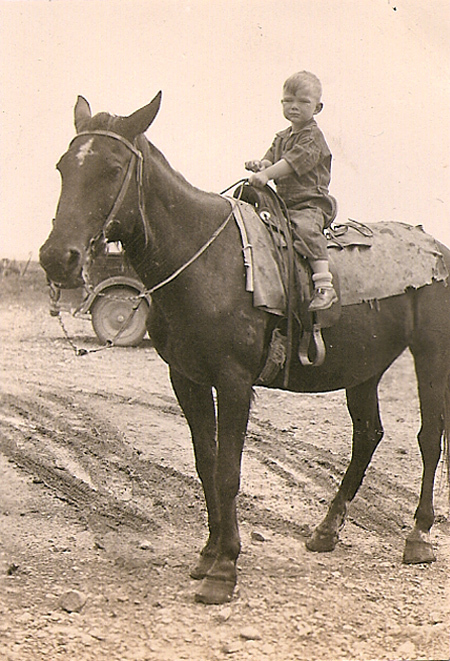 I really wanted to find pictures of my Dad as a child, since I didn’t have any. I scored big time! 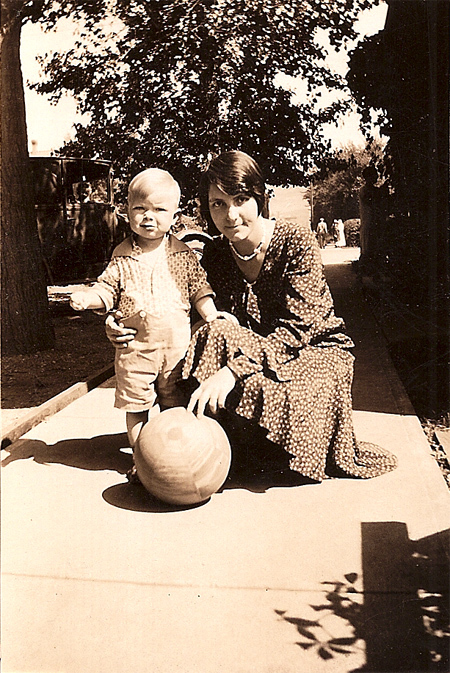 Here he is in December 1928, at the age of 3 months. All this picture really needs is a bearskin rug. I was wowed by this photo of him, as Dad has never been the athletic type. Jack. 3 yrs. 1st horseback ride before falling off. Her parents are in this photo from 1921, with her aunt Nora in the front (basically obscuring her mother, who was Nora’s sister). I found more old photos from my mother’s side of the family too. 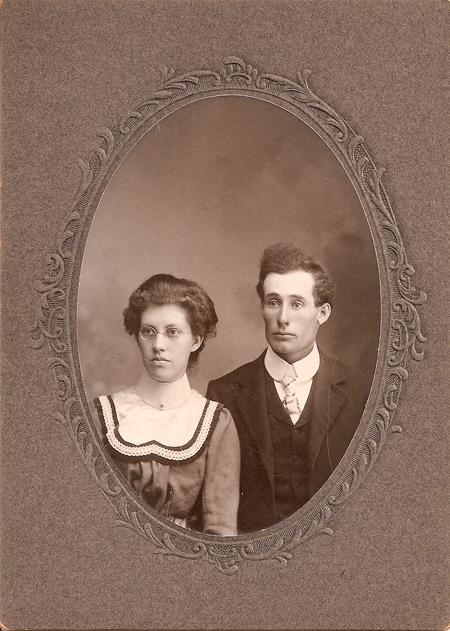 My mother’s great-great-grandparents had 17 children between the years 1851 and 1879. One son died on the same day he was born, and two others died at the ages of 3 and 6. 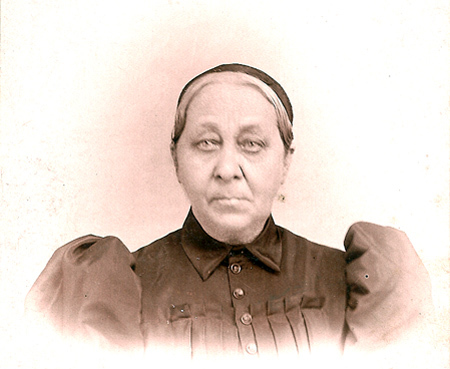 Still: my great-great-great-grandmother must have been a tough old bird! I love her real name though too: Tacy Stackhouse. It’s a full-on Roller Derby name! 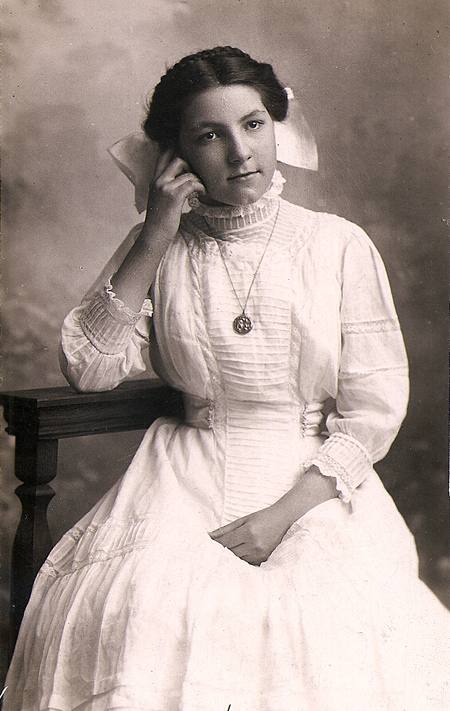 She died in 1905 at the age of 48—my age now—although she looks much older (I hope). Life was hard back then! 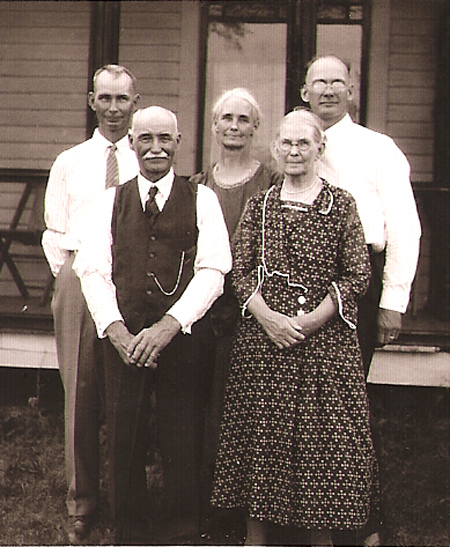 They had five children, one of whom was my grandmother’s father, Clarence. 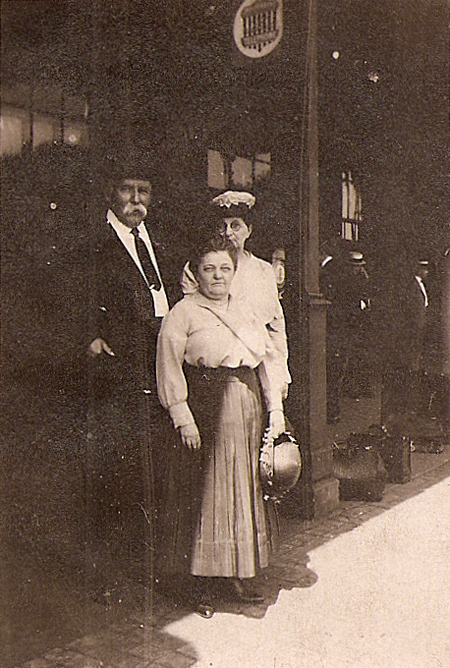 After Tacy died, George married a woman named Caroline Phillips—Clarence had married Caroline’s daughter Maud Phillips in 1900. That made George both Maud’s father-in-law and her stepfather. Can you say “trailer park”? 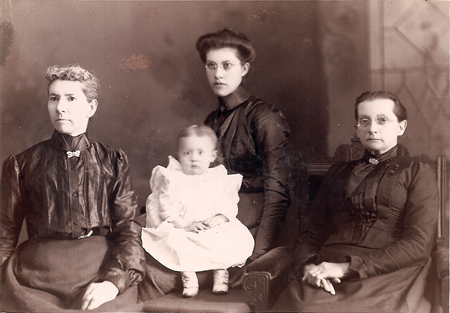 And here she is with my grandmother (they are in the middle, I have no clue who the other two older women are). I’ve gotta say: I’m glad I don’t have to wear those clothes! Maud died pretty young too, from overwork (according to my mother, via my grandmother). I do remember my maternal grandmother very well. I adored her. 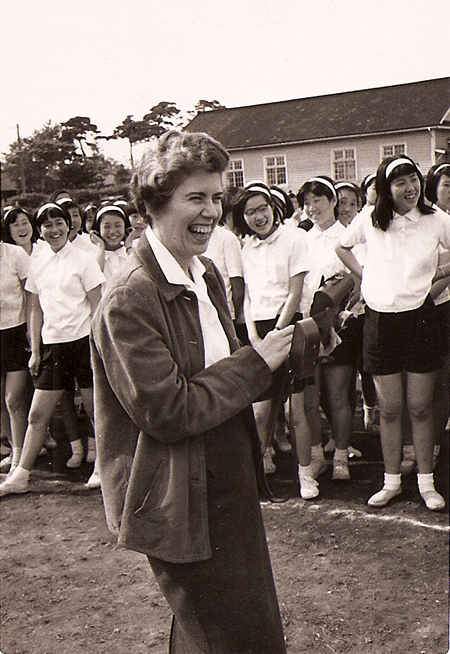 She taught me how to embroider, and how to knit, and made gorgeous quilts for all of us on birthdays and holidays. She died the week before I graduated from high school. She was married once before she married my mother’s father. They had a son. When she divorced him she took him to court for child support (in the 1920s that was highly unusual, bless her). Then she married my granddad, who adopted my Uncle Howard. Granddad had been married before as well, but lost his young wife to cancer. At some point in time, he also had a bad case of smallpox, and his doctor took this picture of him. He was lucky to survive, but he was a very strong man! He had terrible widespread cancer for the last few years of his life and doctors kept saying that he would die any minute. But he told my grandmother that he refused to die until he saw my mother and his grandchildren again (we were living in Africa at the time). We came back at Christmas in 1973 and spent it with them; he died two weeks later in January of 1974. Most of my memories of him involve the TV show “Bowling For Dollars” which he loved and which aired at the same time as a show that I loved called “The Big Valley” (“Nick, Heath, Jarrod, the barn’s on fire!”). He always got to watch his show, because I was scared of him (plus it was his television). Now I realize that he was a big gooey marshmallow inside, but back then I took his teasing very seriously. Granddad came from a big family too, and here are some of them (he’s the youngest, third from the right). 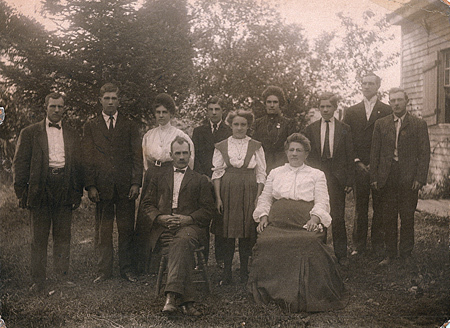 His mother (seated on the right in front) came from Ireland just before she got married. He had twelve siblings, one of whom died as a baby. 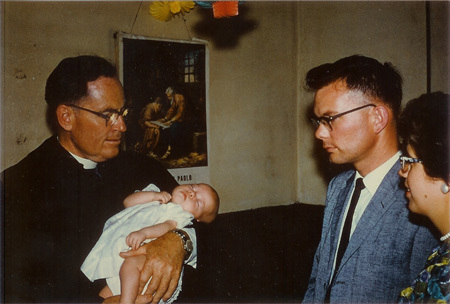 He and my grandmother had another daughter after my mother, named Eileen, who died at four months. I found a note about her written by my grandmother that just made me howl (I’m reproducing it exactly as she wrote it below, except for a few sentences). 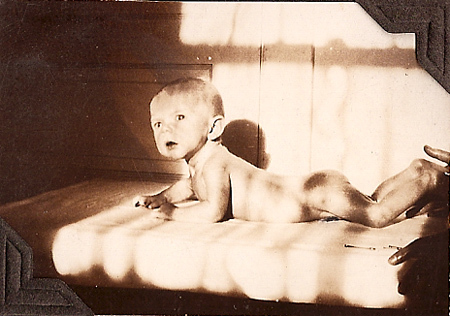 On a Sunday morning Dec. 13-1931 a little seven pound girl came to us. 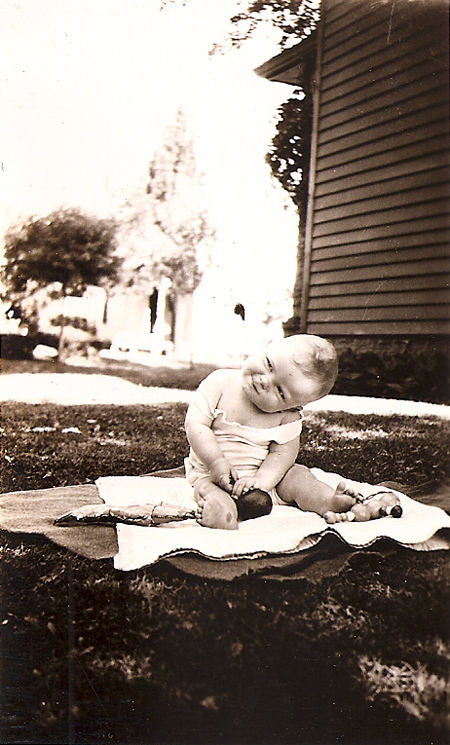 How delighted Howard and Gloria Jean [my mother] were…She had dark hair and dark blue eyes and the loveliest expression about her mouth and chin that I have ever seen on a tiny babe. She was rather Irish looking and we decided her name should be Eileen Joan. She had a hard row to hoe from the beginning as she got a cold right away and mother didn’t have enough nurse for her but after a few weeks on Eagle Brand [condensed milk] she picked up and got so nice and plump. But she had eczema to torment & itch her next so on the doctors advice she was bathed and rubbed with Cuticura which did away with that trouble. She became so sweet & grew to be a very pretty baby with a lovely pink complexion, her dark blue eyes and her hair becoming auburn. She had lots of hair which I cut at seven weeks as it seemed to tickle her ears…She seemed so bright & held up her head much sooner than the others & laughed aloud when we talked to her so heartily you couldn’t tell her laugh from Gloria Jean’s in the next room. She had a nose just like daddy’s and sister’s. How she loved her daddy too, would look around the room for him in the evenings…[They] would play “whoopie.” He would say do you want to play “whoopie” and she’d laugh so spontaneously & happily. He sometimes called her Jo. The night she took ill they played their little game on the way to bed. 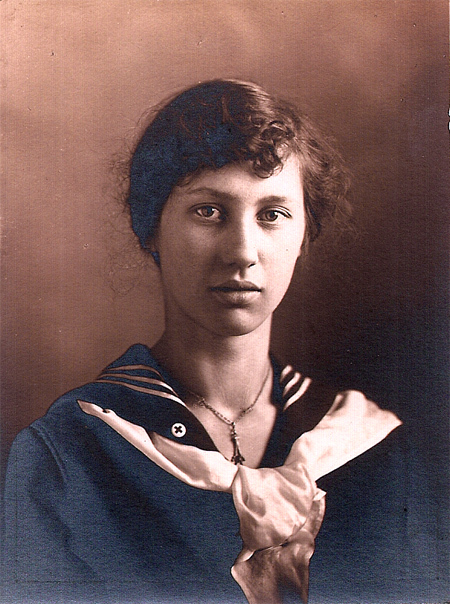 She became feverish in the night (early Thursday morning) and didn’t drink much from then on & seemed so sore on Friday when we handled her, then Saturday afternoon April 23-1932 she left us, a victim of mucous colitis and oh the loneliness she left behind. Her cheeks looked like a half opened rose bud so satiny smooth & delicate [what] a beautiful shaped head she had and and such a pleasant disposition. Mom said: “If she’d lived, I would have been even more of an ugly duckling!” (I’m fairly sure that she was mostly kidding). There were never any photos taken of Eileen, sadly, but here’s the Ugly Duckling with my Uncle Howard. I was a little afraid to ask, but it turns out that his name (which I forget) translated into English as “under the bamboo.” That’s her story anyway, and she’s sticking to it. 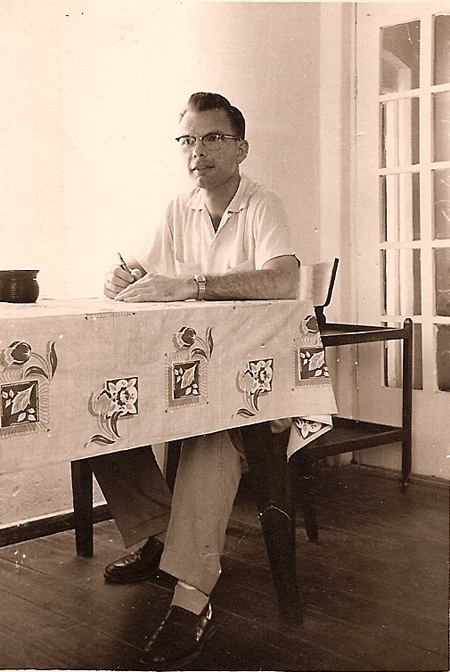 My dad returned to Angola where he taught music, and they wrote to each other for five years. In 1960 they got engaged. 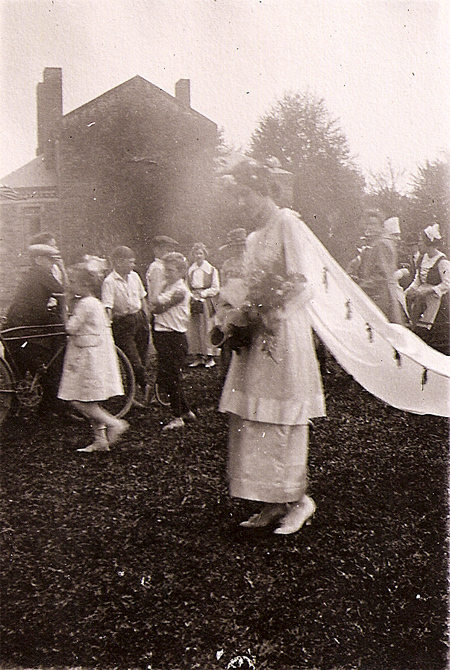 My mother had her wedding dress made in Japan and flew to Angola a week before the wedding. Posted on November 15, 2009 at 6:47 pm in Everything else	| RSS feed You can skip to the end and leave a reply. Can I say that I adore these posts you have with old photographs? Them and all these stories are marvelous. It makes me wish I knew more about my ancestors (My mother was adopted and I don’t speak to my father). This is really lovely. I found out not too long ago that my Mom, who’s one of 4 daughters, had an oldest sister who died when she was a baby and whom my Mom never saw. The knowledge made me inexplicably and inconsolably sad, so reading about your Mother’s sister really hit home. Sigh. My mother said that Grandma never talked about Eileen, and that she (my mother) was in high school before she found out she had had a little sister (she was too young to remember her). I seriously cried like a baby myself when I read my grandmother’s note: she was not a terribly demonstrative woman, although as I said I adored her. I could hear her voice speaking as I read it. She loved spending time with me and my brother and sister. I can only imagine how terribly it hurt her when Eileen died. I suppose a lot of women went through that in those days, if they were lucky enough to live through it all themselves. thanks :) I loved talking with my parents about them—learned all kinds of new stuff about the family! One reason for this post was so that I’d get it documented before I forgot all the details! Hooray! Not only are you back but you bring us back these lovely gifts! I love stuff like this and it reminds me that there are tons of old photographs about ready to disintegrate into powder unless I do something about it – because nobody else in my lazy family will. I’m particularly impressed by the patience in your family – those daguerreotypes took forEVER to shoot. I think there’s a funny story somewhere about Lincoln and how much he hated taking them but took them coz he wanted to win elections or something. I could be making this up. Eileen’s story made me tear up – I had a baby cousin who died at much the same age years before I was born and my aunt is still not over it. We have one little photograph of her when she was a baby and she looks like a much prettier version of me. It’s terrible. 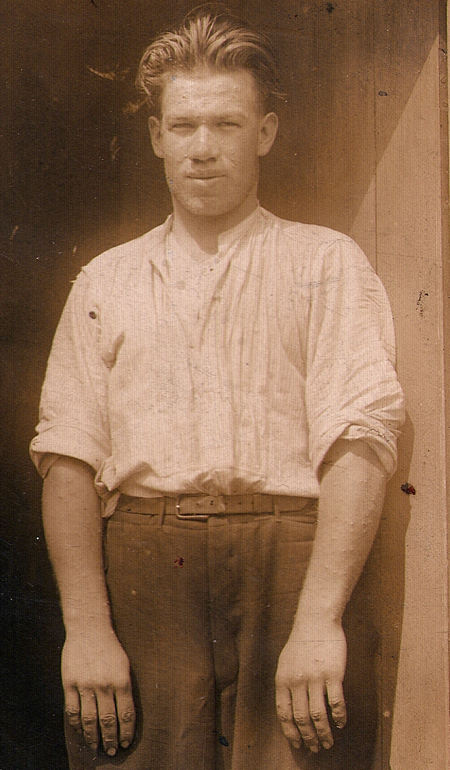 Ooh, Granddad does look like Matt Damon there. Never thought of it. I wish I’d known him better (that he’d lived longer)—my mother is just like him, according to everyone, and I am just like her. So, ergo…I think we would have gotten along famously. Loved the post. All that sepia. You are lucky to have all those photos. I’ll have to read this again to get all the stories right, but aren’t all the women in your family B-E-A-U-T-I-F-U-L. But I AM a Battle Axe ;-D My life has been much easier than hers, no doubt. What really struck me going through all these pictures was how strong the women were, on both sides. I am proud to come from that kind of stock, as it were! Fantastic photos! What a sense of history! Hey Memsaab, welcome back. All those lovely pics – all the way from 1862 onwards!!! There were a couple of photos of Dad sitting with his head tilted like that. Makes my neck hurt to look at them. What a lovely post, Greta. These pictures look so beautiful – and the people in them look so very beautiful too. It is really good that you managed to spend time with your parents and get hold of these family history pics. And the way you have written about this is very lovely too. I’m glad you enjoyed it :) It has been fun learning more about the history of my family. I really had no idea that we had photographs going back this far…I think I’ll need to put together some sort of family tree (with pictures). What a lovely treasure you found! Enjoy it, there is such detail in the photos. only Indians developed the language for family! At least Hindi, Punjbai and Urdu as far as I know but I bet all the others too. I am all for inventing words in English on the same scale. At the moment I am translating a scene where there is a sakhi masi, a sakhi bhua, a chachi, a tayi, a chacha-saura, a masad, etc… and the whole bunch gets translated into “Aunt A on left, Aunt B on right”. great pictures and writeups. I am glad to see your ancestors maintained them so well. I am certainly grateful to them :) thanks Hildebrand. Thank you so much for sharing these (both pictures and the notes). They are amazing. It’s so wonderful that you have such extensive knowledge of your family history. I love looking at old photos. And LOL about “I was a little afraid to ask.” I would be too; Mr. Under-the-Bamboo was pretty darned handsome! Oh what a lovely post! and its great that you have all these pix saved, u lucky girl! How do u take care, of them- keep them safe? i need tips- i’ve very few pix, all of which seem to be fading. My poor Mom…I spent some time yelling at her for putting scotch tape on some of these pictures. I’m scanning them, and the actual photos that I have I am putting into photo albums with archival paper. It helps, but there’s nothing you can actually do to stop photos from fading (that’s why I’m scanning them). Love this! Your parents had such amazing lives, it’s no wonder you and your sister are such interesting people. Seriously, I could write an entire blog about the Beiges. But I won’t. My mom was threatening to come here and read what I’m saying about all of them (but she won’t). Wow! Lovely photos. Now I know where you get your looks from – from a long line of beauties! And I am trying to imagine what you would have looked like if your Mom had married “Mr Under-The-Bamboo”! And yes, referring to all these grand and great grand parents is so much easier in Hindi! I was mentally drawing family charts throughout and gave up half way through and just enjoyed the pictures. Apart from the history and all the family snippets, the pics are worth it for a look at the clothes alone! My favorite is your Dad’s Mom’s dress in her picture with your Dad and the football. There are quite a few great ones of both my grandmothers in flapper dresses! I love that era. I need to get busy on a family tree/chart before I forget who all the Eberhardts and Phillipses etc. were. Welcome back, memsaab. Missed you here :-). But you have made up for your absence with this fantastic review of your family history. Such a collection of precious photographs!!!! I must mention the lovely frame and the much lovelier photograph (the first one). Glad you enjoyed it. Yes that first photo—frame and case and everything—is precious. Lovely, simply lovely! Thanks so very much for sharing. If I encountered that behbeh in pic 17, I would steal it, hide it in my backpack and bring it home to cuddle. It is so adorable! So it is just as well that behbeh is not around me. LOL! I can’t believe you counted down through all those photos! You must like my little behbeh Grandma to make that Herculean effort. I really do. I want to eat her. YUM! You are so fortunate to not only have the pictures, but have people who can help you identify everyone. I have dozens of pictures, which I have been scanning but there’s no one left to help with identification. My dad doesn’t remember and his brothers are considerably younger than he is so they don’t have a clue either. 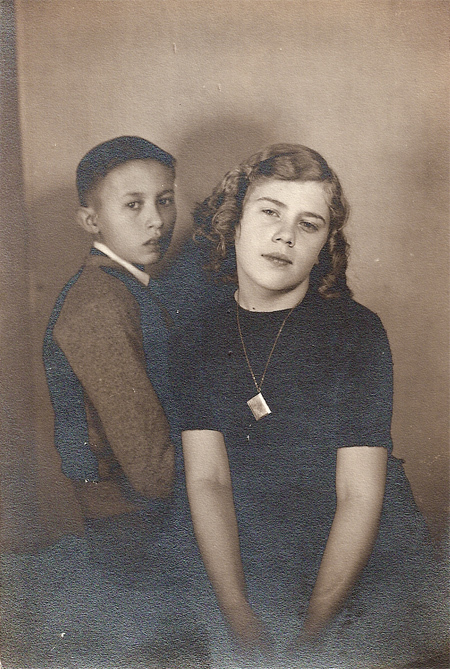 And sadly on my mother’s side, they were so poor, that they have very few photos at all. Also, be especially careful with your daguerrotype. Those are one of a kind and the case is part of the construction, not just a holder. It keeps the glass plate and the chemicals from separating and ruining the image. You might figure out who some of them are eventually. My Dad doesn’t really remember much either, except when something random triggers a memory! Luckily everyone in my family loved to write on the back of photos. But there were some that I couldn’t identify either (and scanned anyway, just because they are interesting pictures). 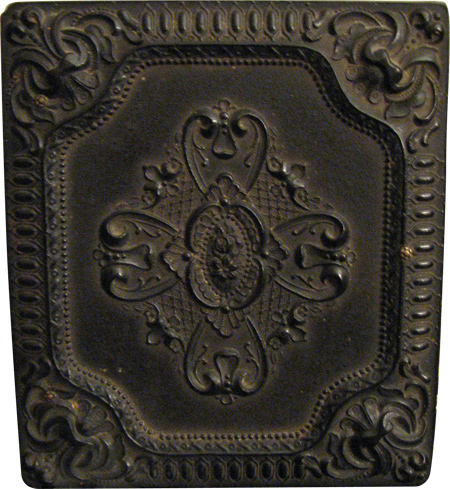 Re: The daguerreotype, I don’t really know much about them but I knew enough not to pry the photo out of the case. It is very solidly in there, and even so there is tarnishing around the edges of the oval. 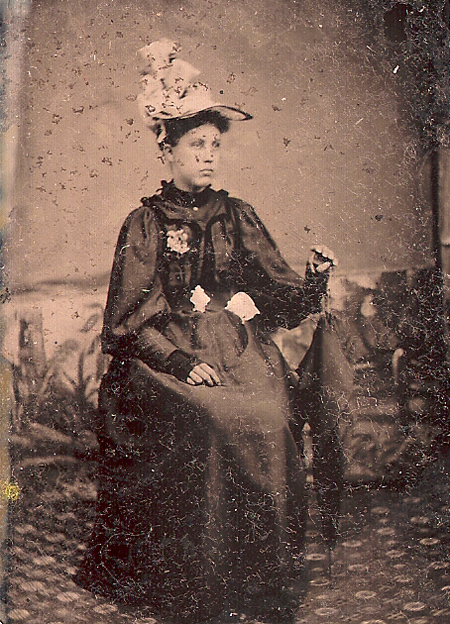 It may be a tintype, it’s hard for me to tell, although it has that silvery quality that is described for daguerreotypes. There is a loose tintype of the same great-great grandfather (the man) floating around without a case, but it isn’t as lovely as this one and it’s gotten dark and pretty scratched up. And thanks :) I’m glad to be back! Why couldn’t you EMAIL ME OR CALL ME to tell me you posted something! Someone gave me a scanner for this exact purpose, and I still haven’t done anything yet. Very bad! I have to add: I don’t know how common this was, but my paternal great-grandfather and great-grandmother were also step-siblings. Their parents married and had a few more kids, and then his son married her daughter. Holy Brady Bunch! We only figured it out by reading how the “preceded in death” and “survived by” relatives were described in the obituaries of their mutual half-sisters. It didn’t make any sense at all until suddenly the lightbulb went on. Well you have to be in the mood. How wonderful Greta! I so enjoyed seeing these photos and reading about them, also. My favorite was the boneless shot of your dad! How wonderful to have all of these photos. Once you have them all on a CD you can take ’em down to Walgreens and have more prints made…might make some good Christmas presents for family. I hope you will treat us to more snaps! I’m glad you liked the photos…but it’s time for more movies again! :) Masala zindabad!!! Awesome. You are so lucky to have all these pictures. So many of my grandparents’ pictures have been lost. I was quite surprised at how many there were (you have NO idea!!! I will never get through them all! )…I always thought of us as a throw-away everything type of family. I have to echo the others by saying “beautiful” again. These photos are precious, and all the more interesting and sentimental (even to us strangers) because of your witty commentary. I’m sending my mom a link to your blog! There were quite a few unidentifiable ones…but I am lucky that many were labeled. I never really knew most of my relatives since we grew up so far apart. I found out that one of my distant cousins has traced my father’s side of the family—one branch all the way back to 1300! That’s a LOT of people. Dizzying. You can take on the scanning project for your family ;-)! What we need is a family tree! All the Clarence and Clarions just confuse me. And your grandfather looks despite the small pox damn good handsome! And your grandmother looks so beautiful! And she fought for her rights! Great Guts! Well, I have a much better understanding of the family tree now than I did two weeks ago! :) I’m glad you enjoyed it all too! I stumbled upon your blog when I was looking for some information about a movie last week. I browsed through some of your posts (I love the story about the Russian ex-boyfriend! :-) and found it pretty interesting. I just re-visited your site, and I found this entry. I love the way that you have incorporated the photos with your family (hi)story. In recent years, I have been working on a similar project for my family, and I really appreciate what you have put together and shared with everyone. I really enjoyed reading about your family as it reminded me of some of my own family’s stories; your grandmother’s letter and the story about baby Eileen was especially poignant. Thank you again for sharing, and I look forward to reading more of your blogs. Thanks Roli :) Please do keep coming back! it’s been a while since I’ve left a comment, but do know that I still come to your site regularly! I too enjoyed this post as geneology is my Mother’s passion. She spends much of her spare time researching her side of our family and will publish her research when its complete. I unfortunately don’t share the same passion — at least not yet, but I very much appreciate all the work she has done. So good for you for taking an interest in preserving the family tree — I’m sure your siblings appreciate your efforts as well. And FYI, my favorite photo is the picture of you at what must be your christening ceremony! You were a very cute baby even if you were born without bones! Hope you had a nice Thanksgiving and here’s hoping that a lot of new hindi films will be released over the upcoming holidays! Be sure to let the photos of the lodge cycle through — I imagine this as the perfect place to end a trip. Two to three days of relaxing, taking in the gorgeous views and hiking the trails to nearby villages. Enjoy! Take me to Leti with you!!!! OMG I am spellbound. I don’t want to visit—I want to LIVE there. And I’m glad you like the Leti Lodge — I think it’s pretty amazing too. I do hope to travel to India again next year — if I make it, I will stay there. I have only been to India once and so haven’t yet seen Calcutta and Varanasi. And then there is Corbett National Park (elephant trekking), Kujaharo, Amritsar, Darjeeling or Ooty. And I could go on — if only I could travel for a couple of months at a clip, I could create an awesome vacation! I am envious of your 4-5 trips to India! As I write this, I am thinking of another spot in India where I stayed on my first trip — at the risk of boring you, will find the web site for that and send you that link as well. Here you go. This is in Rajashthan not too far from Pushkar. I highly recommend it. As you can tell, I love to travel. If there is ever a meeting of fellow hindi film fans in India, count me in! Hope you enjoy the link. Wow Chhatrasagar seems to be an interesting place to stay. I have travelled all over Rajasthan (of course a decade ago – time flies past). I wonder if this resort is a new development. Meeting of fellow hindi film fans in India – what an awesome idea. Count me in Memsaab! This longish peek into your family history was real fun and moving. Keep giving us such breaks. You are really lucky to have pictures like these. 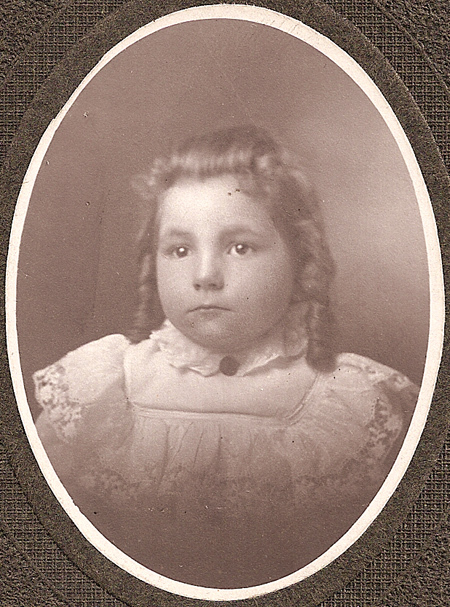 I am having trouble to find even 1 picture of my father’s mother and father. They died when my father was young. They are lovely. I am glad I had a chance to look through them with my parents there so that they could tell stories about the people in them too. I don’t have any children (except Gemma) but my brother does, and hopefully they will find them interesting some day :) And at least they are preserved now for them. That’s really great. Hey by the way I’m new to your blog it’s fantastic…I found this from looking through Rajesh Kumar’s pictures on google (don’t ask) and it brought me here. Have you watched legendary films such as Pakeezah, Mother India (i’m assuming you’ve watched this how can u not have), Heer Ranjha, Laila Majnoon, Ganga Jumna etc? I wonder what you think about them…If you have I want to read it :D Thanx take care.